It took me three tries, but I have finally finished ‘Salem’s Lot. There’s something about King’s writing where you have to be in a very specific mood to read his stuff. I’m not sure how to explain it, but I think anyone who reads his books will understand. In typical King fashion, there was jumping around from character to character, but it allowed for a depth to the character development and everyone got their own arcs. It took awhile for things to get going, but once they started it was full speed ahead. It went so quickly that I feel like some things may have been left out (somehow, with Mr. Descriptive). I can’t put my finger on exactly what that would be. With some of the deaths, it felt sort of like “oh, they’re dead now. Okay.” They just came out of nowhere with not much build up. It was interesting. Much like with IT, it took a turn that I wasn’t expecting. I don’t really know what I expected from ‘Salem’s Lot, but I didn’t expect it to be a book about Vampires. That was a bit of a shock to the system, as I don’t typically go for vampire novels. But the time we get to that reveal, it’s a bit too late to turn back. Overall – I enjoyed it. I don’t know if it liked it due to the quality of the book or just because it’s a King classic. 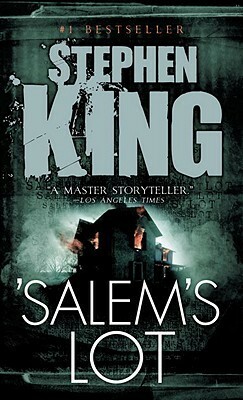 Either way, if you’re in the mood for some Stephen King, I’d say it’s a good read with some likeable characters.